I have to confess up front that I am a long-time cat lover. I do love our one dog Bella (a beautiful golden retriever) but my heart beats for the three cats who currently make-up part of my family. And if you're anything like me the stories about my pets are plentiful. The occasional time when I do run out of my own stories and anecdotes, I go looking for others. 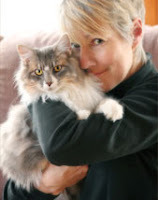 I was thrilled to discover local author Kathy Chisholm's new book Urban Tigers: tales of a cat vet. In this book Chisholm tells the tale of Dr. Emily McBride's first year at the fictional Ocean View Cat Hospital in Halifax. I laughed out loud a few times and the tears threatened to overflow on a few more occasions. The cast of characters, human and feline, carried this story and left me wishing for more! Chisholm tells her tale in a human, funny and realistic way and takes us behind the scenes with the people who care for our beloved four-legged family members. Whether you live with cats, love them from afar, or sit on the fence, this book will leave you delighted. P.S. When Kathy recently read from this book at the Keshen Goodman library she let it slip that there was a sequel to this book already in the works. Keep a watch out in our catalogue for the next installment. Thank you, Louise! I really appreciate your support. I am glad to see it is so popular with library patrons. Urban Tigers 2 is "finished" but it still has to go through editing. I'll keep you posted.